Have you ever seen that fast-running, long-eared mammal that resembles a large rabbit, having long hind legs and living typically in grassland or open woodland? It is the hare. De Oschtahaas. In the local Alsatian dialect of my village, this is how the Easter Hare was called. The “Easter Bunny” indeed is a hare, not a rabbit. According to the legend, only good children received gifts of colored eggs in the nests that they made before Easter. Homeland to the Easter Bunny (Easter Hare to be precise and according to the original tradition) is Alsace. When we were kids, the house of our parents was just beside the farm of our grand-parents. There was a huge garden and an orchard. On Saturday before Easter we used to cross the road to go to the grocery and ask for material to build our nests. They had some great stuff, kind of wooden straw which was used in boxes to protected the packed items against shocks. Then each child was building its nests secretly, so that nobody could come and steel the eggs and chocolate the Easter Hare would bring. I remember that I was always worried about how the “Oschtahaas” would find my nests if they were hidden too carefully. Some years later, my younger sister used to follow the same tradition with his cousin. They were 7 or 8 years old at that time and had their mind full of foolery or was it just immagination? They built the nests but also hided some traps in the garden, hoping to be able to capture the Easter Bunny! 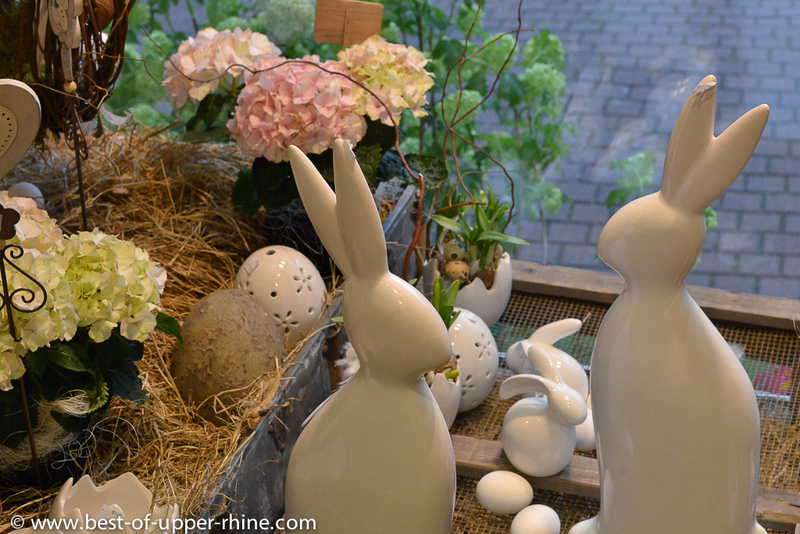 Osterhase – the original Alsatian Easter Bunny. First mentioned in a book published in 1682. The Easter Bunny or Easter Rabbit is a character depicted as a rabbit bringing Easter eggs. The Easter Bunny is sometimes depicted with clothes. In legend, the creature carries colored eggs in his basket, candy and sometimes also toys to the homes of children. Actually, in the original tradition, it is not a rabbit but a hare. Almost 20 centuries ago, in Europe, Saxons used to hold a fertility celebration in honor of the Goddess Eastre, whose sacred animal was a hare. The hare is often associated with moon goddesses; the egg and the haer together represent the god and the goddess, respectively. Pagan fertility festivals at the time of the Spring equinox were common. It was believed that at this time, male and female energies were balanced. The Christian church found it easier to absorb those Pagan practices. 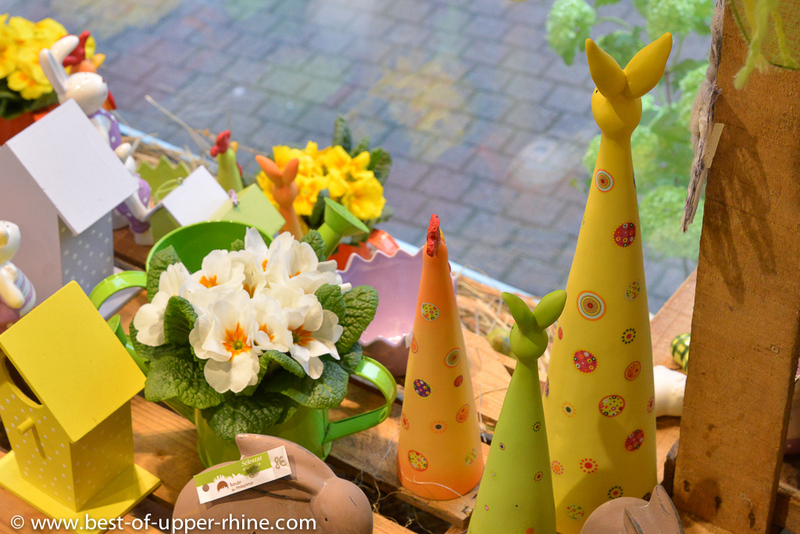 Easter Bunnies originate in Alsace. Alsace has always been a German culture area before being integrated into France some 3 centuries ago. Georg Franck studied medicine and anatomy in Strasbourg where he received his M.D. in 1666. In legend, the creature carries colored eggs in his basket, candy and sometimes also toys to the homes of children. Actually, in the original tradition, it is not a rabbit but a hare. The tradition of an egg-laying bunny then went to America in the 18th century. Alsatian and German immigrants in the Pennsylvania Dutch area told their children about the “Osterhase”. “Hase” means “hare”, not rabbit. In those early years of the 21st Century, the tradition of the Osterhase – the Easter Bunny – is still very popular in Alsace. Florists, confectioners, chocolate makers are offering bunnies and colored eggs. Our Alsatian villages, especially Riquewihr, start their first decoration of the year with the Easter Bunny. 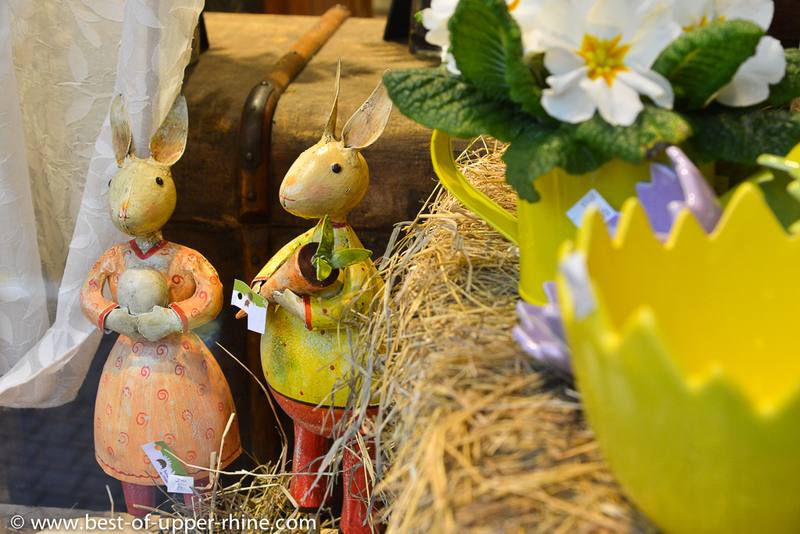 Pictures taken at the florist Boule de Mousse in the town of Sélestat near Riquewihr in Alsace. 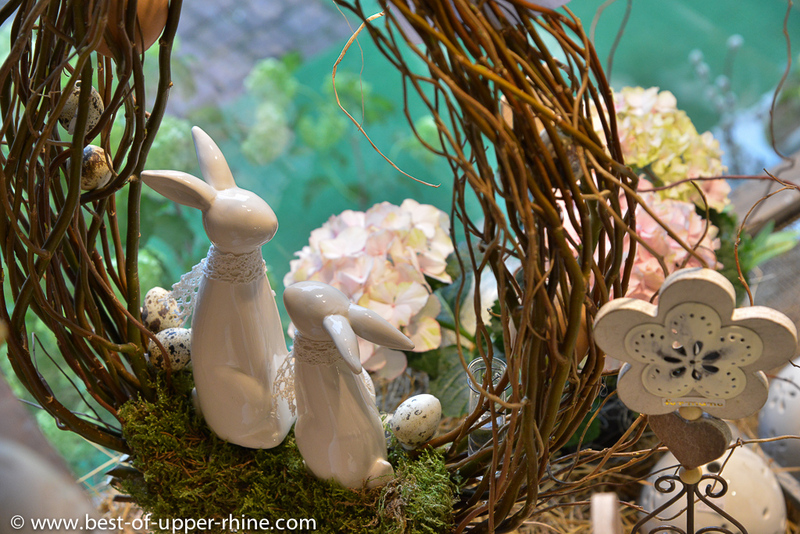 Easter decoration is dispayed in our luxury holiday homes in Riquewihr, Alsace.